Geothermal works because the ground beneath our feet is warmer than the outside air in the winter and cooler in the summer. 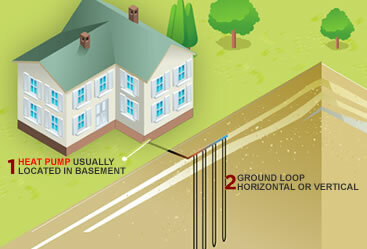 Inserting a series of small pipes, called loops, into the ground allows heat to be transferred to and from your home. In this process heat is not created, it is transported therefore no fuel is burned. Ground temperature is a constant 55 degrees, regardless of the temperature outside. The East Coast and specifically Maryland are great areas to install a geothermal system. 2. Ground Loop – underground pipes which connect to the heat pump. A vertical loop field is the most common installation process for a geothermal heat pump that is installed. During a vertical loop field installation a series of holes are drilled, each between 200-400 feet deep. Then, piping is fed down these holes and connected in a loop pattern. 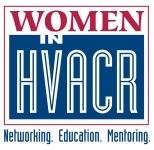 Once all of the pipes are connected together outside of the home they are threaded into your home and attached to the heat pump unit. This process is often completed by a geothermal driller in 1-2 days. Winter Operation: The underground pipes, called a ground loop, circulate water which absorbs the heat from the earth and returns it to the indoor heat pump. The heat pump extracts the heat from the liquid then distributes it throughout your home as warm air. With the heat energy removed, the water is re-circulated to collect more heat from the ground. In this case the loop water is warmer when it comes into the home than when it goes back into the earth since the heat is being removed. Summer Operation: The indoor heat pump takes the hot air from your home and removes the heat. This leaves behind cool air to be distributed through your vents as air-conditioning. The removed heat from the air is rejected into the earth through the water circulating through the ground loop. The EPA has acknowledged geothermal systems as the most energy efficient, environmentally clean, & cost-effective space conditioning systems available.